I layered Bravo Burgundy, Rose Red, Soft Suede, Bermuda Bay and sheets from the Thoroughly Modern ds. The Soft Suede layer was color embossed with Soft Suede ink in the Finial Press Textured Impressions folder. The flower was made from about a zillion layers of vellum sponged with Rose Red ink. These little birds are so sweet. It just made me go awwwww!!! I love it. Very pretty - I love your torn edges and that flower is gorgeous! Thanks for playing along this week! Beautiful card...great job on your coloring! 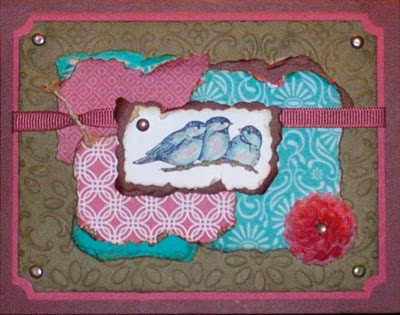 Love all the torn edges going on on your card!!! Great job using our sketch and thanks for playing along with us over at Stamping 411!! Love those birds Lisa! You are really on a roll girl. I love all the texture that your torn edges creates here! Amazing job on this sketch challenge Lisa!